Joint pain can affect any of the joints in the body, such as the spine, hips, knees, elbows, fingers, and feet. It is experienced by both adults and children, based on several factors such as age, trauma, activity or a recent illness. It can range from a mild aching pain and soreness in the joints to acute pain. Arthritis due to aging is one of the most common causes of joint pain, and should be treated at a pain management clinic. A joint is the connection between two bones. Joints allow the various movements of the different parts of the body. They are the reason for the wiggling of the hips; bending of the knees, elbows and back; turning of the head; and moving of the fingers and toes. Joints need lubrication to function properly, just like the parts of a vehicle need oil for movement. Joints are cushioned by cartilage, synovium and the synovial fluid which is a lubricant, and they make sure that the bones do not rub together. To gain better awareness of the problems caused by joints, it helps to understand the different types of joints. Joints can be widely classified as Synovial and Non-Synovial or Solid joints. Synovial joints: Known as diarthrosis joints, they are not in continuity and they contain joint space or cavity between ends of bones, which contains the synovial fluid which acts as a barrier and protects them. A synovial membrane lines the joint. They are linked by a fibrous capsule and the joint surfaces are covered by articulary cartilage. Diarthrosis joints allow wide range of motion. Perfect examples are the knee, shoulder, elbow and wrist. Non-Synovial or Solid Joints: Also called, Synarthrosis, these joints provide the body strength because they offer limited movement. They contain no joint space between bones. The sutures of the skull and the bones that connect the teeth to the skull are examples of synarthrosis. With age, due to the wear and tear, the bones get damaged, leading to problems like arthritis. Injury can also lead to joint damage. The best way to keep the joints healthy is to keep the muscles, ligaments and bones strong. Joint pain can be caused by a variety of conditions as well as injuries, and advancing age is one of the major factors. Whatever the cause, the pain can be very troublesome and debilitating. 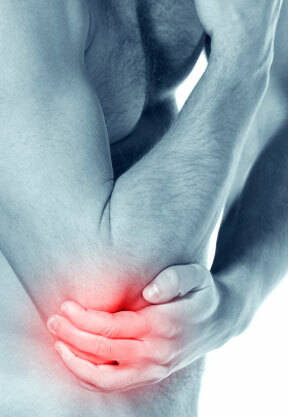 Symptoms of joint pain vary depending on the problem that is causing the pain. This can be knee pain, pain in the elbows or even in the fingers. A visit to the physician will entail a comprehensive medical history and physical examination. The doctor will ask questions pertaining to the symptoms, including the location, duration, onset, constancy of the pain. You will be asked if the pain subsides with resting and the positions that you are comfortable in. The physician should know of any numbness in the joint. Bone scan to diagnose infection, fracture or other bone disorders. The test to be done is decided by the physician, after a thorough history and physical examination. Treatment for joint pain is targeted toward the underlying cause, depending on the diagnosis. If it is caused by an injury, conservative measures such as anti-inflammatory medications, rest and cold applications are administered as the initial treatment. After this, a physical therapy may be needed. Additional medication will be considered only if the pain is not controlled. If the pain is caused by a form of arthritis, anti-inflammatories are prescribed, followed by other arthritis medication. Surgical options are only considered if there is a disease of the bones, cartilage or ligaments. o Non-steroidal anti-inflammatory medications (NSAIDs), such as aspirin, ibuprofen (Motrin, Advil), Cox-2 inhibitors (Celebrex) or naproxen sodium (Aleve) are used for moderate-to-severe joint pain. Other than Celebrex, the other Cox-2 inhibitors are no longer in use because of risk of heart attack and stroke. o Acetaminophen (Tylenol) for milder pain without swelling. o Anti-rheumatic drugs (DMARDs) such as Methotrexate or biologics. o Anti-malarial medication, such as Plaquenil used together with Methotrexate may be prescribed. o Opioids are used for severe pain. They cause drowsiness and are only used under the supervision of a physician. o Muscle relaxants for muscle spasms. o Antidepressants and antiepileptic medication that interferes with pain signals. o Topical agents like Capsaicin. o Alternative treatments with glucosamine and chondroitin supplements help with joint pain. These are components of a normal cartilage that protect the bones and joints. While they may not work for everyone, they are safe to use and have no unwanted side effects. Physical therapy: This usually follows the ‘initial’ treatment for joint pain and is aimed at releasing the stiffness of the joints and restoring proper movement. Cognitive Behavioral Therapy (CBT): This is acognitive-behavioral approach to pain management with three components. The first component is meant to help patients realize that cognition and behavior can make a difference to the perception of pain. The second part of CBT is aimed at learning to cope through relaxation techniques that help reduce the tension in muscles, emotional distress, as well as divert the mind from the pain. The third component involves applying the skills learned consistently. TENS (Transcutaneous electrical nerve stimulation) Unit: This involves stimulating nerves in the painful areas through the use of electric current using a non-invasive device that is battery-operated. This reduces the perception of pain. Weight control: Obesity is one of the major causes of joint pain. Many patients have experienced significant relief from pain after losing weight by taking nutritious diet and exercises. Drastic and other unnatural weight loss measures should not be resorted to, as that leaves open the potential of further aggravation in joint pain. Rest and exercise: Appropriaterest is suggested for joint pain with non-strenuous weight-bearing exercise, like walking for 20-30 minutes daily. Acupuncture: While needles are used in this procedure, this is conservative in nature. It involves placing many disposable needles to stimulate the body’s energy channels, to help overcome pain and other illnesses. Acupuncture has shown excellent relief from joint pain, and is also considered to release endorphins, the pain-blocking chemicals. Yoga and meditation: Simple non-strenuous yoga exercises provide significant relief from joint pains, ensuring flexibility. Meditation provides the mental relief that helps with quick healing. Aquatic Therapy or Hydro therapy: This is a water therapy where patients have to immerse the body in water for some time on a regular basis. The buoyancy of the water reduces the stress of gravity, allowing patients to exercise in water, even after surgery. Home care: These are simple techniques termed as PRICE: Protect, Rest, Ice, Compress, Elevate. o Protect by using a wrap or a brace. o Rest by staying away from pain-causing activities. o Ice several times a day, for about 15 minutes each time. o Compress with an elastic wrap. o Elevate the affected joint. Injections: Steroid injections with or without a local anesthetic, administered directly into the joint every 3-4 months is the next option. These injections are very effective for joint pain caused by arthritis, disease or inflammation. Hyaluronan injections are synthetic joint fluid used for treating osteoarthritis. The joint fluid in injected to provide the lost lubrication for the joints. Nerve blocks: These are also injections that use steroids and anesthetic, where the medication is injected into the nerves near the area of pain, to block or numb the nerves, to make sure they don’t send pain signals to the brain. Spinal cord stimulation:This involves implantation of tiny electrodes within the spine to interfere with the pain sensations. Severely damaged joints either due to disease or injury may require surgery. It is only done as the last resort. o Synovectomy: This involves removing the inflamed synovium, which is the joint tissue/lining. This is done when the inflamed joint tissue is causing unbearable pain or limiting the range of motion. It is usually performed on joints affected by rheumatoid arthritis, and in cases where the pain persists even after 6-12 months of administration of other treatment modalities. o Total joint replacement: While this may seem scary, there are more than 3 million Americans who undergo total knee replacement each year and almost a million people undergo total hip replacements. Most joint replacement surgeries are targeted at osteoarthritis patients that have not responded to any other treatment, and offer dramatic improvement. Joints not only allow movement, they are also the most important parts of the body. Any problem with the joints can impact the quality of life. In fact, joint problems caused due to lack of nutrition and exercise, are known to be more debilitating than those caused by injury. Most joint conditions are progressive in nature, and it is important to seek early treatment to ensure restoration of health to the joints, and in turn to the body as a whole.